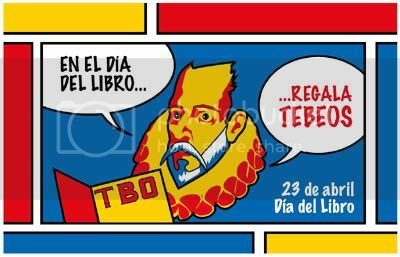 Mañana es el Día del Libro, y desde aquí quiero unirme a la iniciativa (como ya hice el año pasado), 'El Día del Libro, regala tebeos'. Scarlet Traces, una aventura de ciencia-ficción escrita como una continuación de 'La Guerra de los Mundos', y que tiene lugar en Inglaterra 10 años después del fallido intento de invasión extraterrestre. Así que ya sabeis, si mañana os da por regalar algo, acercaos a una librería especializada, y dejad que el librero os recomiende algo. Hay comics para todos los gustos y las edades. Y NUNCA es tarde para empezar a leer comics. Soon I met some people with my same interests, most of them continue visiting my space, and they are in the list of 47 feeds I'm suscribed to. The 99 previous post have been most of them bilingual, and 35 are labeled 'comics', showing that, despite this is not a comics blog, I'm a comic reader, and I like to talk about them, and 23 are labeled 'friki/geek'... same applies here. This is not a geek blog. But I'm a geek. And 23 posts are labeled 'Erasmus'... which I know most of the recurrent readers are here for. I've been using google Analytics for a little more than a month, but it shows what I already knew: between 120 and 160 visits per week (depending on how often I update), many readers form Sweden, Spain, and some from Argentina (well, and many other places, but these are from where I ALREADY KNEW that they visited me... mexicans and americans usually get here by hazard). I don't know how GA measures the recurrent users (cookies or IP? ), but the last graph shows that most of the people that comes here knows where they are going. My only complain is that you don't comment much. But you are out there and you read me. And that's enough for me. Thank you very much for accompaning me. Y parece que aún fue ayer... el 31 de mayo de 2005 (pol culo...) empecé mi antiguo blog, en MSN spaces. Empecé por pasar el rato, porque tenía mucho tiempo libre en el trabajo (tiempo libre en el trabajo, juas, suena gracioso). Pronto conocí personas con intereses parecidos a los míos, muchos de los cuales me siguen visitando, y a los cuales tengo entre los 47 feeds a los que estoy suscrito. Los 99 posts anteriores a este son casi todos bilingües (olé mis huevos), y de ellos 35 están etiquetados como 'comics', lo que muestra que aunque este no sea un blog de comics, yo leo muchos comis, y me gusta hablar de ellos, y 23 están etiquetados como 'friki/geek' por lo mismo... este no es un blog friki. Pero yo soy friki. Hay 23 post etiquetados 'Erasmus'... que sé que son la razón de que muchos de los usuarios recurrentes estén aquí. Sólo llevo usando Google Analytics poco más de un mes, pero muestra lo que yo ya más o menos sabía: entre 120 y 160 visitas por semana (dependiendo de cuánto actualice), muchos visitantes de España y Suecia, y algunos de Argentina (bueno, vaya, y de más sitios, pero de aquí es de donde YA SABÍA que me visitaban.... los mexicanos y americanos suelen llegar aquí de casualidad). No sé como mide GA los usuarios recurrentes (cookies o IP? ), pero el último gráfico muestra que la mayoría de la gente llega aquí sabiendo a dónde viene. Mi única queja es la escasez de comentarios. Pero estáis ahí, y me leeis. Y eso es suficiente para mí. Posteado por Valaingaur a las 9:38 pm 3 Comentarios al respecto Comenta o sufre mi ira! Just follow the link. It is a very nice flash game/animation that shows you how the different drugs alters your brain functions. Very illustrative. Simplemente seguid el link. Es un juego/animación en flash, que muestra cómo distintas drogas afectan el funcionamiento del cerebro. Muy ilustrativo. Por cierto, genial el 'ratoncito del buen rollo', XD. Posteado por Valaingaur a las 10:52 am 0 Comentarios al respecto Comenta o sufre mi ira! All of you who know me more or less, will know that I'm not very fan of manga or anime (well, despite the classics like Dragon Ball, Saint Seiya or Captain Tsubasa). But lately I've started to watch some anime series (I rather anime than manga). I saw Evangelion (which, by the way, I didn't understand, and I don't like very much), and very recently I saw .hack // SIGN, and I really liked it. All started when, googling (that verb exists?) for Idunnowhat, I found a picture of Mimiru (see below). I like girls. And I like big swords. So I started to search more about her, and then I downloaded the serie. You will allow me to copy some from the Wikipedia, won't you? .hack (or Project .hack) is a multimedia franchise primarily created by Bandai. The series encompasses four games for the PlayStation 2 console, three anime series and several manga series, as well as novels. The franchise primarily surrounds a future in which one operating system, Altimit OS, is used by nearly all computers in the world due to a computer virus named Pluto's Kiss that crashed the Internet, shut down all networked computer and communication network control systems, and sent hundreds of PC users into seizures on December 24, 2005. From that point on, Altimit OS became the only major operating system in the world, and the only OS allowed on the Internet. This is credited to its remarkable stability. The primary focus of the franchise, however, is the popular MMORPG The World, the first network game to be allowed to run after the events of Pluto's Kiss. It was wildly popular, with over four million users signing up at its launch. The series focuses on a particular set of events known collectively as the Twilight Incident, in which multiple users were forced into a coma while playing the game. Most of the stories revolve around a group of AI, including Aura, Morganna, Aura's "child" Zefie, and various other anomalous AI. .hack // SIGN, the only of the animes I've seen by now, follows the story about Tsusaka, a player that is trapped in The World, and cannot disconnect. The serie has almost no action sequences, but instead is driven by mystery, going deeper in the characters' personalities and the relations between them. The way of telling the story is very oriental (I'm sure you all know what I mean), but I liked it, and despite the end is not a big surprise, is logical. That you don't see very often in anime series. I'm not going to spoil you anything, I will just recommend you all to get the serie (however you want), and enjoy it. I saw it in OV, and I strongly recommend you all to do the same. Anime dubbed is like... frozen vegetables. Ah! And the soundtrack is amazing. Todos los que me conozcais más o menos sabreis que no soy muy fan del manga o el anime (quitando los clasicazos como Dragon Ball, Saint Seiya (a.k.a Caballeros del Zodiaco) o Captain Tsubasa (a.k.a. Campeones). Pero últimamente he empezado a ver algunas series de anime (prefiero el anime al manga). Vi Evangelion (que, por cierto, no entendí y tampoco es que me gustara demasiado), y hace poco he visto .hack // SIGN, que me ha encantado. Todo empezó un día que estaba googleando (ese verbo existe?) noseque, y encontré una foto de Mimiru (ver más arriba). Me gustan las chicas. Y me gustan las espadas gordas. Así que empecé a buscar más acerca de ella, y luego me bajé la serie. Me permitireis un poco de copypasteo de la Wiki, no? A principios del siglo XXI, Internet se ha extendido por todo el mundo y es accesible para cualquiera. Debido a esto, el número de virus y ataques por la Red se dispara. En un intento de contrarrestar esa situación, se crea el Consejo Mundial de la Red, (CMR), bajo la supervisión de las Naciones Unidas; pero todo es en vano, los ataques y los virus siguén asolando la Red. El 24 de Diciembre de 2005 un nuevo virus, el Beso de Plutón, ataca la red: todos los sistemas caen, todos los sistemas conectados a Internet se descontrolaron e incluso el sistema de defensa nuclear de Estados Unidos está a punto de atacar. La Red se restaura 77 minutos después, pero se restringe el acceso a Internet hasta el 24 de diciembre de 2007, fecha en la que sale a la venta The World. El juego cosecha un gran éxito en todo el mundo, debido a su gran realismo y libertad de movimientos que ofrece, y por tener la opción de jugar con un FMD, unas gafas que permiten meterse de lleno en el juego y jugarlo como si fuera real. También contribuye a ello el hecho de ser el único juego disponible en ese momento. La manera de contar la historia es muy oriental (seguro que sabeis a lo que me refiero), pero me ha gustado mucho. Y a pesar de que el final no es una gran sorpresa, tiene su lógica. Y eso es algo que no abunda en las series manga. No voy a spoilear nada, simplemente os recomiendo que consigais la serie (como sea que os guste) y la disfruteis. Yo la vi en VO, y así se la recomiendo a todo el mundo. Que el anime doblado es como... yo que sé, verduras congeladas. Posteado por Valaingaur a las 9:30 pm 2 Comentarios al respecto Comenta o sufre mi ira! The destruction of Pompeii in 79AD is the most viewed video at YouTube. The first comment is..."OMG so cool! Volcanos ROCK!" Attila the Hun has his own MySpace page. Nobody ever rejects his "invite a friend" emails. The soothsayer's "Ides of March" email fails to get Caesar's proper attention as it's inadvertently filtered into his junk folder. But at least Caesar's "Et tu Brute?" comment is available as a free ringtone download. The domain gladiator.rome sells for the record sum of 1,000,000 denarii. The owner of hadriansucks.rome is compelled to hand over both the domain name and selected body parts by an independent domain tribunal chaired by...Emperor Hadrian. "Naked Cleopatra" is the top search term on Google. Unfortunately, the Queen of Egypt dies an early death after misunderstanding IT's call to embrace an ASP solution. Hannibal blogs his way across the Alps with posts like, "Whoops, lost another elephant today." But he runs out of money when his PPC budget is plundered by an iberian click scam organized by Publius Cornelius Scipio. Tiber.com opens, initially selling scrolls and tablets before expanding to include togas, pottery, and do-it-yourself mosaic kits. Websites like handsome-literate-male-british-slave.com pollute the search listings thanks to generous commissions at the slaves.co.rome affiliate program. Roman programmers moan about projects outsourced to cheap coders in Mesopotamia. The Colosseum is renamed the eBay Colosseum, with free wireless hotspots outside the lark's tongue restaurant. The volume of spam collapses when the penalty for not providing a working opt-out mechanism becomes equal billing with the lions at the eBay Colosseum. But we still get emails featuring Brunhilda, the lonely Visigoth, and hot deals on cheap peacock livers from Gaul. Nobody invents a spam filter good enough for the House of the Vestals. Finally, Rome burns to the ground while Emperor Nero battles online with Hakkar the Soulflayer in World of Warcraft. La destrucción de Pompeya en el año 79AD es el video más visto en YouTube. El primer comentario es..."OMG como mola! Los volcanes son lo más!" Attila el Huno tiene su propio MySpace. Nadie se atreve a rechazar sus emails de 'invita a un amigo'. El email premonitorio "Ides of March" no llega a la atención de Cesar y es filtrado a su carpeta de correo no deseado. Por lo menos, su última frase "Et tu Brute?" está disponible para descargar como melodía para el móvil. El dominio gladiator.rome se vende por la suma record de 1,000,000 dinares. El propietario del sitio hadriansucks.rome es obligado a entregar el dominio y determinadas partes de su cuerpo por un tribunal independiente presidido por... el Emperador Adriano. "Cleopatra desnuda" es la búsqueda más veces realizada en Google. Hannibal bloggea su paso a través de los Alpes con posts como, "Ups, hemos perdido otro elefante hoy." Se inaugura tiber.com, al principio vendiendo tablas y pergaminos, y ampliando después su oferta a togas, vajilla y kits de mosaico házlo tú mismo. Sitios como handsome-literate-male-british-slave.com infestan las listas de búsqueda gracias a generosas aportaciones al programa de afiliados a slaves.co.rome. Programadores Romanos se quejan constantemente de proyectos encargados a la mano de obra barata de los programadores de Mesopotamia. El Coliseum es rebautizado eBay Colosseum, con puntos de acceso inalámbrico gratuitos en las afueras del restaurante de lengua de alondra. Nadie es capaz de inventar un filtro de spam suficientemente bueno para House of the Vestals. Los frikis clásicos llevan camisetas como, "there's no place like CXXVII.0.0.I"
Finalmente, Roma arde hasta los cimientos cuando el Emperador Nerón lucha online con Hakkar the Soulflayer en World of Warcraft. Lo siento, algunas traducciones no son de lo mejor (y un par directamente no he sido capaz de traducirlas), así que los que os deis maña con el inglés,... mejor leerlo en inglés. Posteado por Valaingaur a las 12:17 pm 0 Comentarios al respecto Comenta o sufre mi ira!